Win a La Mer Pink Neon Silver Wrap Watch in Spring Fashionista Giveaway Event + Over $20,000 in Prizes! 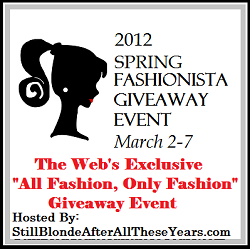 Welcome to the Spring Fashionista Giveaway Event featuring over $20,000 in prizes and over 100 participating blogs! Wouldn’t it be great to win your Spring wardrobe and not be out a dime? I’d love to get all my Spring fashion for FREE! This is a semi-annual, ALL FASHION, ONLY FASHION Giveaway Event. This is the Largest Fashion giveaway event on the internet, hosted by Still Blonde after all these YEARS with co-hosts The Socialites Closet and Modly Chic. 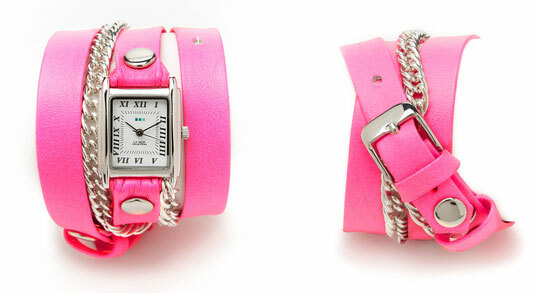 First, enter to win here for a $100 La Mer Neon Pink and Silver Wrap Watch via entry form below. The Grand Prize for the Event is a $1200 (retail) Marc Jacobs bag via Bella Bag. For every giveaway in the Spring Fashionista Event that an entrant enters, they gain one entry toward the Marc Jacobs Bag. After you enter here, scroll to the end of the rafflecopter form and you can enter to win at the other blogs listed. It’s your chance to win a LOT of great hot new items for your Spring wardrobe! Enter to win this La Mer watch via the rafflecopter entry form below. You may need to allow a few moments for the form to load. This giveaway is open WORLDWIDE, 18 years and older. Giveaway ends March 7, 2012 at 11:59 pm EST. Winner will be notified via email and have 48 hours to respond. Please note that this is self-sponsored and we are in no way associated with La Mer. « See visibly younger skin in just 7 days. Get a free 7 day supply! a basic white t-shirt, it goes with just about everything! a nice sun hat here for indian weather . In Arizona it’s hot in the spring, so shorts or capris are a must. Along with sandals. My wedges with spring dress is the piece I can’t go without during the season. I can’t leave without pretty sandals and floral frothy dresses! A nice glammed up sweater! My spring basic is a white t-shirt. flip flops and a nice bag and watch. I cant live without my cute kitten heeled flip flops! I love the colored jean fad! I can’t live without my huge, neon green George, Gina & Lucy bag! It’s so perfect for spring! My cardigan for the cooler weather. My coral colored high heels! A new pair of flip flops. My white T-Shirt and jean capris! One piece that I can’t live without for my Spring wardrobe is new feminine dress!!! I can’t live without my floral spring scarf! my hoop earrings, I love them all year round but wear bigger ones in spring and summer months. I love my pretty sandals! My black suede knee-high lace-up boots. I love to wear them with black stockings and shorts while it’s still chilly outside. Can NOT live without my FLIP FLOPS GOT TO HAVE THEM!!!! flirty floral dresses, a blazer or jean jacket. I love my short skirts can’t live without them!! I need a brightly colored bag for a true Spring style. A good pair a flip flops!! My sandals. I absolutely love them. I actually wear them year round here in TX. Flats and spring dresses and skirts! A new handbag! Mine is falling apart! What is one piece that you can’t live without for your Spring wardrobe? My jean capris..thanks so much for this chance!! No spring in the Philippines! But I would have to say I love wearing a good pair of jeans-whether it’s sunny or raining outside. Thanks for the chance! My new pink Coach bag!!! Definitely my capris!! Means it’s warming up in MN! Flip Flops or Wedges. Also, strapless bra, seeing as how I wear quite a few dresses and tops that I would need to wear with. I couldn’t live without platform sandals in the spring! In my spring wardrobe I love to have beautiful button up sweaters. A stylish and comfortable pair of sandals. 🙂 Thank you. I can’t live without light, comfy skirts! Sandals/summer shoes that are supportive and can be worn for hours. So many great ‘looking’ shoes, kill my feet. And shoes are your support – they look good, feel good and let you show off whatever you choose to wear. Cannot live without my pastel pink pumps in the spring! LOVE them! I can’t live without my flip flops!! Ghetto, but true! I can’t live without cute sandals! Thanks for the chance to win! My Bohemian style gypsy skirt! I have to have my sandals. Hello, I have to have a good pair of sunglasses. Thanks for a great giveaway! I cant live without white t-shirt! Adore a new pair of snappy stylish sandals shoes. thanks for the great giveaway hop too. My maxi dresses are a must have for Spring. I love cute bright colored blazers! Thank you for the giveaway! I hope I win! a new handbag i need one bad!! I follow on pinterest and twitter, but it wont let me put my name. Pinterst and twitter are lorirc42409. Sandals….I cannot live without cute sandals. I can’t live without my capri’s for my spring wardrobe! Can’t live without my handbag! I can’t live without my maxi dresses! Can’t live without a cute bag! I cant live with out my sandals and vibrant colored cardigan sweaters! my black & white plka do Nike Dunks! I have to have a new bag in a bright color for Spring. gotta have lots of flip flops! I cannot live without my sunglasses! Getting a new handbag, I love spring cleaning and I always start with a new purse! I have to have t-shirts, jeans, flipflops, and a good purse that will hold everything the grandkids collect! I can’t live without sunglasses. I need my sandels! Thanks for the chance! I don’t really have anything. I am not much of a fashion person. I always have to have a watch!